Here she is. Cairo cat, tail curling under her lion’s body. She’s not flawless. And she has not, as they say, had work done. Not on her face anyway. They have rebuilt her paws, only practical. But in fact, no make up artist in the world could fix the damage to her noble face — and yet people come from all over the world to look at her in awe. Stately. Knowing. She has seen it all. 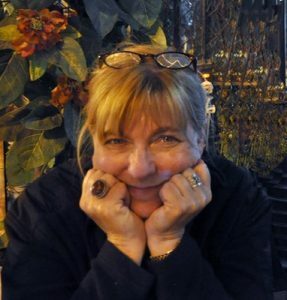 And looking at her, I want to ask thousands of questions, one for each year she has had her eyes trained on the desert. If history is prologue, do we dig into it simply for understanding? As in, whose shoulders are under us on which we are standing? Or there a hint of the future in studying the past? The pyramids — there are over 100. Big. Huge. School kids around the globe make models of these four sided wonders. But how were the originals made without forklifts? Without tractors? 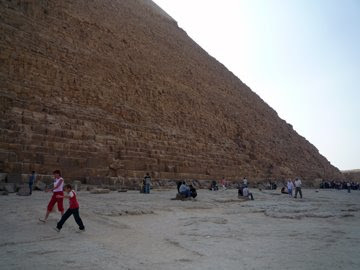 Some say they built the sand up around them and rolled the 2-7 ton stones in place. Some say it was aliens. How many died in their construction we can only guess. 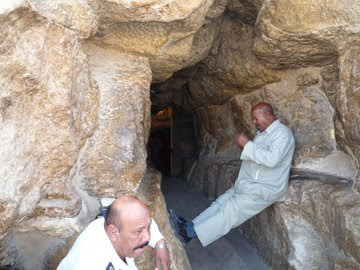 The picture of the man whose task it is to guard the entry of the empty tomb puts the size of the stones in perspective. These were mined from a quarry across the Nile, brought by barge and rolled on logs into positions over decades to erect the pyramid. 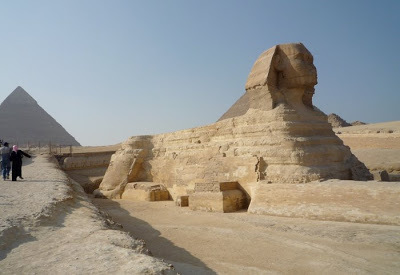 Beside the great pyramid are smaller ones for several of the Pharaoh’s wives. 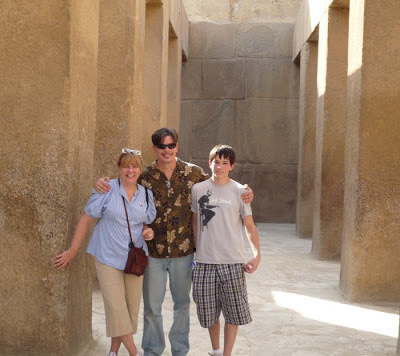 Below are Michael, Frank and me posing in the mummification temple located at beside the pyramid. Outside the entry (I did not go in, asthma and a twinge of claustrophopia) instead opting to take pictures of Frank and Michael as they join a school group on their steep descent into the empty tomb. Beside the pyramids were the usual collection of vendors hawking small models and stuffed camels. One man gently caught my elbow as I walked past. I am used to shaking off vendors, so I kept walking until he said, “Obama.” I looked down. I was wearing a campaign button. He put a thumbs up. “Obama.” I replied. “Barook Obama.” He said smiling. “Barrack.” I said. “No Jack,” he said. “Obama.” We were in agreement. Egypt is the strongest democracy in the Middle East, a long standing ally of the US. Here, as all over the world, people are watching our election process carefully. The peaceful transition of power. The history of yesterday and the history that is being made on Tuesday all coming together as two strangers touch hands and exchange smiles. 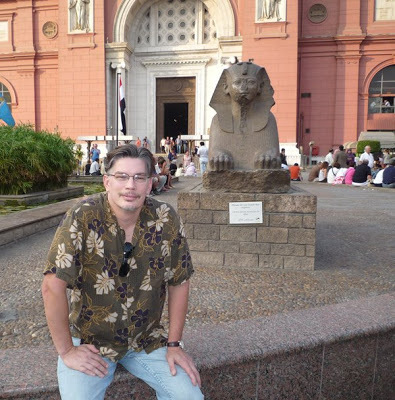 The final photo is of Michael sitting outside the Museum of Antiquities in front of another Sphinx. Turns out there are lots of them. This is not a model, though smaller than her sister in the desert, this ol’ girl is also thousands of years old. 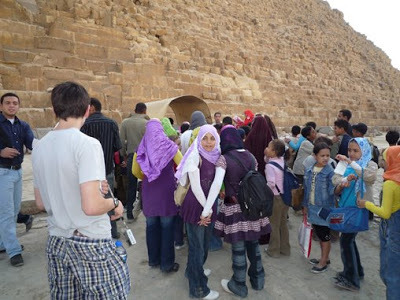 Try to make it to Luxor, to see the Karnak temple and the Valley of the Kings! They are amazing, I have seen them. But try to be at the Valley at 6 am when they open – to avoid both the heat and the queues! we made it to the valley of the kings! At 7AM and you are so right, it was hot hot and this is November! The sights AND the crowds were astouding.